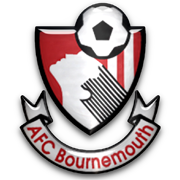 Swindon first met Bournemouth and Boscombe Athletic in 1923 - a hat-trick by Jack Johnson ensuring a 3-0 win for the Town in Bournemouth's first league season, after they had spent the previous three years in the Southern League. 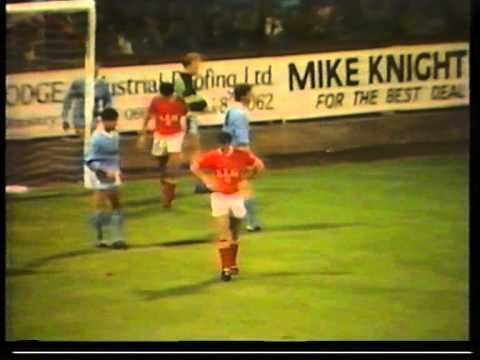 Upion entering the league, they had changed their name from Boscombe to the longest team name in any of the four divisions - it wasn't until 1971 that they reverted to the now familiar AFC Bournemouth name, and changed their kit to AC Milan inspired red and black. 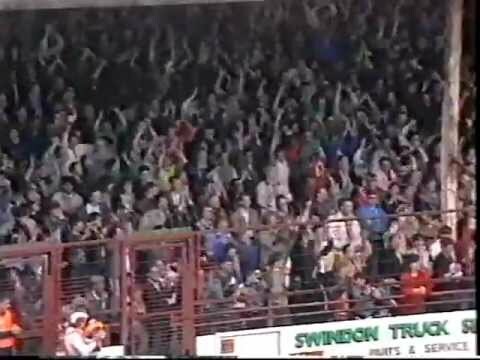 In the teams' first six encounters, the Town managed to score a total of fifteen goals, despite not scoring in any of the three away matches - two goalless draws at Dean Court were followed by a 2-0 defeat in 1925 - but at home, Swindon followed up their 3-0 opening victory with a 4-0 win the following year, and then in early January 1926 they notched eight past the hapless Cherries, despite going 2-0 down in the opening five minutes, with Frank "Swerver" Richardson helping himself to four of the goals. 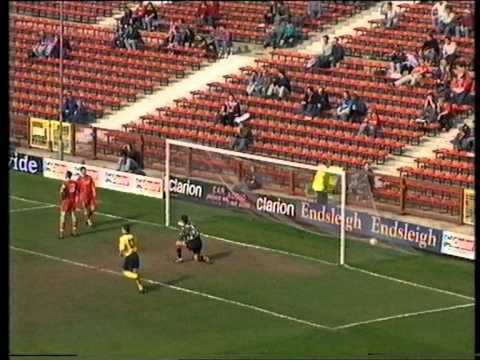 After normal time ends goalless, Swindon look dead and buried in this Freight Rover Trophy tie when they concede twice in the first period of extra time - but the Town get lucky, pulling it back through two Peter Coyne goals, before winning the penalty shoot out 4-2. 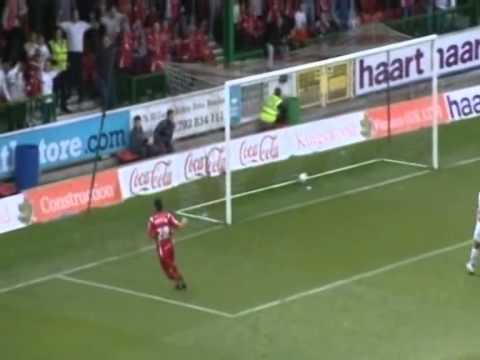 Over fourteen thousand fans are at the County Ground to see this top-of-the-table clash - a Dave Hockaday goal earning the Town a point against the Cherries. 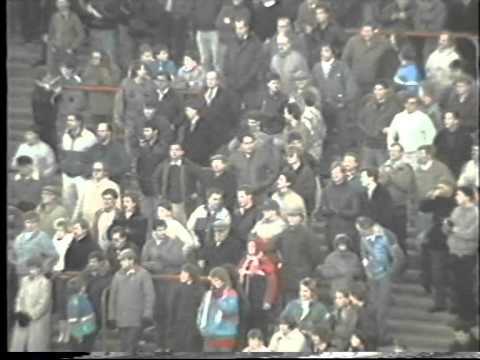 With Town boss Lou Macari away on a scouting mission, his team net twice in the first nine minutes to set them on their way to a comfortable victory over Bournemouth - the Cherries reduced to nine men with two red cards in the second half. First half goals from Colin Calderwood and a Ross MacLaren penalty put the Town well on the way to victory over the Cherries - and though the visitors get one back, Bobby Barnes nets a late goal to seal the points. 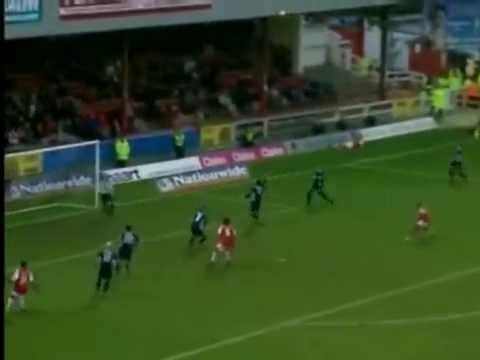 Swindon win the Performance of the Week award with a 3-2 win over Bournemouth at Dean Court, which sees the Town leapfrog their opponents into seventh place in the Division Two table. 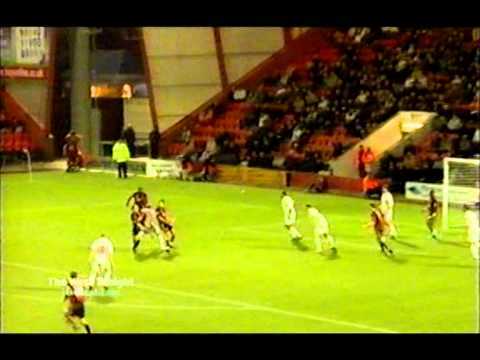 Two goals from Shaun Brooks helps the Cherries to a surprise win at the County Ground. 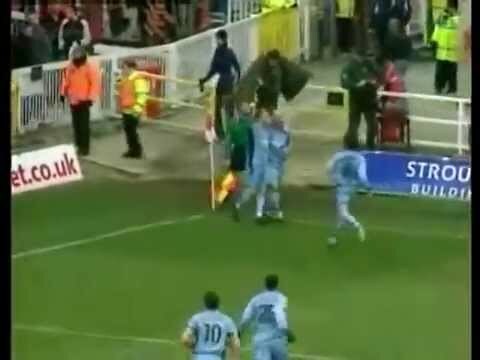 As Fraser Digby misses out through injury, Jon Gittens' late header wins three vital points for the Town. The Cherries and the Robins play out a goalless draw in the fog at Dean Court. 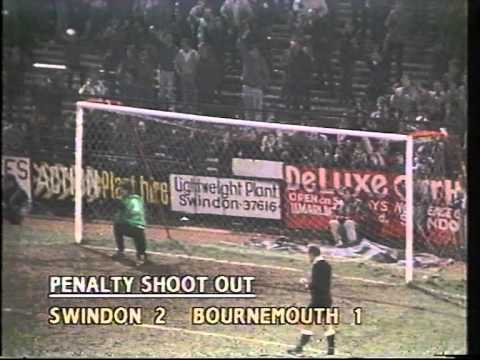 Swindon seem to be on their way when Kevin Horlock opens the scoring - but two goals from Bournemouth's Steve Jones turns the game on its head, until a dodgy penalty award sees Horlock net again to rescue a point for the Town. 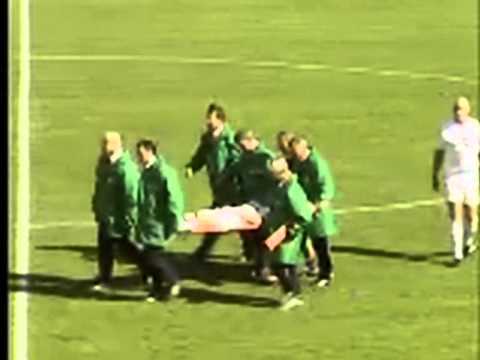 A match memorable for all the wrong reasons - a terrible tackle from Wade Elliott effectively ending Keith O'Halloran's career. 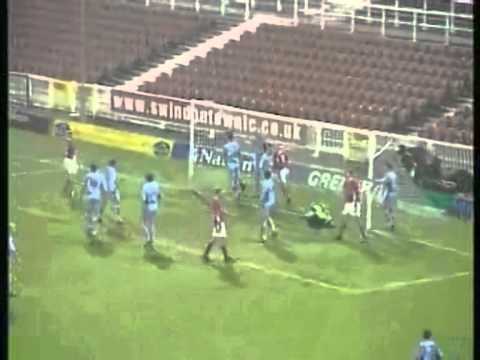 Reinstated Town boss Andy King receives what the Swindon Advertiser referred to as "a reception usually reserved for the pantomime villain" on his first match back in charge - three players are sent off as Swindon and the Cherries play out a feisty goalless draw. 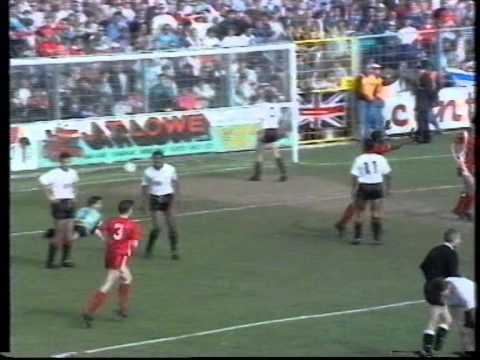 With both of their kits clashing, the Town hastily bring out a white third shirt for the game at Bournemouth - but though the Town lead twice, they are pegged back by the Cherries. 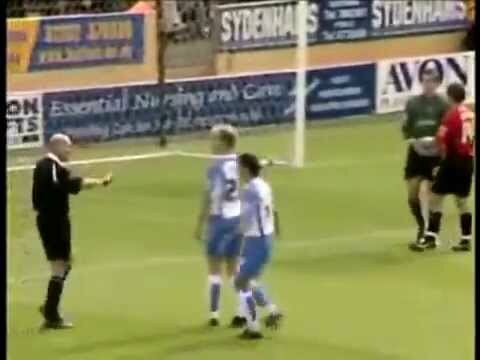 James Hayter scores early for Bournemouth - but two Tommy Mooney strikes move the Town into the play-off places. 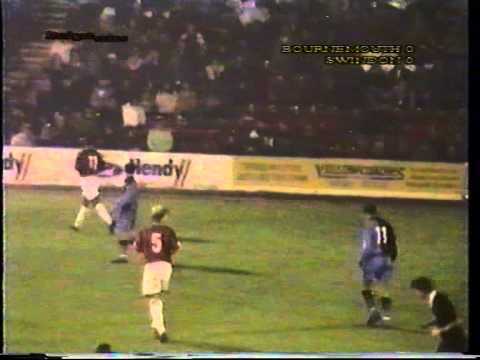 A Sean O'Hanlon goal is sandwiched by two goals for the Cherries in their 2-1 win. 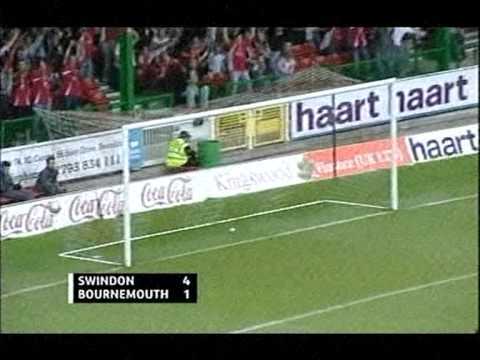 After six games undefeated, Swindon go into the game with the Cherries full of confidence, knowing that a win would see the Town leapfrog them and into the play-off positions. Both sides have players sent off - but with Andy Gurney seeing red after just 23 minutes, the Town are behind before Josh Gowling receives his marching orders. 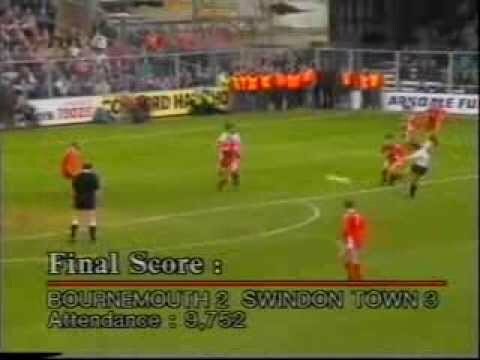 After taking a two goal lead, the Town threaten to throw it away against the Cherries - but goals from Rory Fallon and Lee Peacock on his debut seal a win for Swindon. 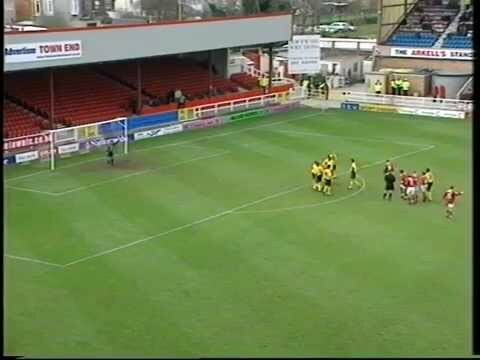 Though Bournemouth equalise after Simon Cox scores his first League goal for the Town, generous defending allows Billy Paynter to regain the lead - and he goes on to net a second half hat-trick on his home League debut. 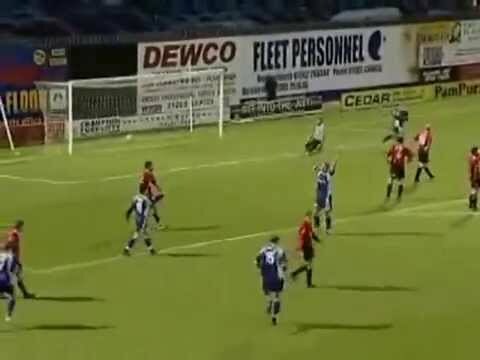 Barry Corr gives Swindon the lead with a superb, curling strike from outside the area - then nets again with seven minutes to go to secure a draw, after two lucky strikes for the Cherries. 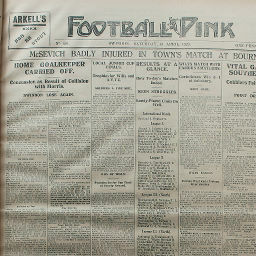 Click to view a newspaper report of Swindon's 1-2 defeat at Bournemouth and Boscombe Athletic in the 1928-1929 season. 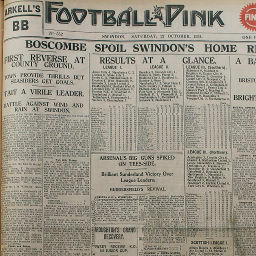 Click to view a newspaper report of Swindon's 1-1 draw against Bournemouth and Boscombe Athletic in the 1929-1930 season. 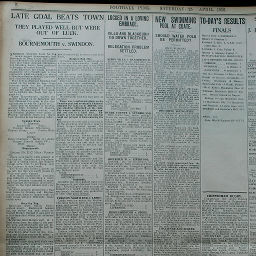 Click to view a newspaper report of Swindon's 3-1 win at Bournemouth and Boscombe Athletic in the 1929-1930 season. 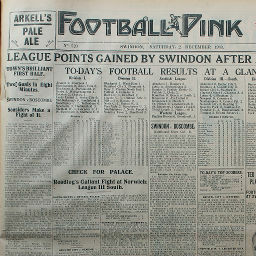 Click to view a newspaper report of Swindon's 4-1 win against Bournemouth and Boscombe Athletic in the 1930-1931 season. 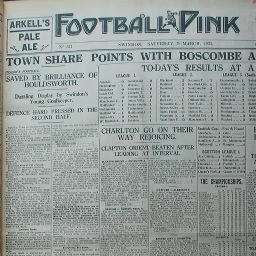 Click to view a newspaper report of Swindon's 1-5 defeat at Bournemouth and Boscombe Athletic in the 1932-1933 season. 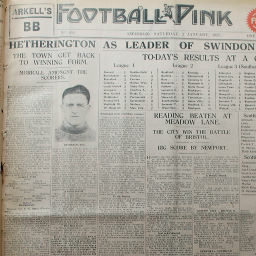 Click to view a newspaper report of Swindon's 2-0 win against Bournemouth and Boscombe Athletic in the 1932-1933 season. 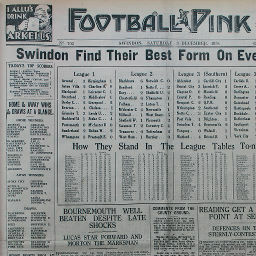 Click to view a newspaper report of Swindon's 3-2 win against Bournemouth and Boscombe Athletic in the 1933-1934 season. 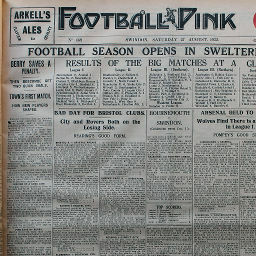 Click to view a newspaper report of Swindon's 1-1 draw at Bournemouth and Boscombe Athletic in the 1933-1934 season. 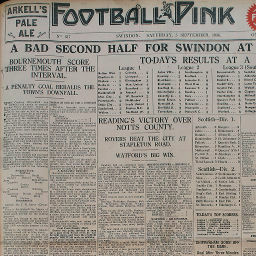 Click to view a newspaper report of Swindon's 0-2 defeat against Bournemouth and Boscombe Athletic in the 1934-1935 season. 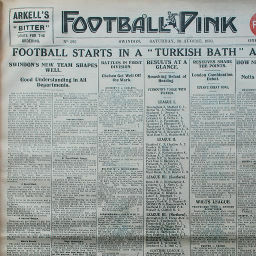 Click to view a newspaper report of Swindon's 1-1 draw at Bournemouth and Boscombe Athletic in the 1934-1935 season. 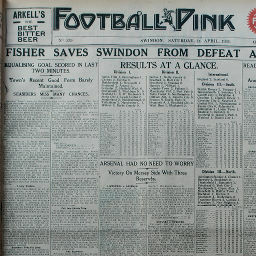 Click to view a newspaper report of Swindon's 2-3 defeat against Bournemouth and Boscombe Athletic in the 1935-1936 season. 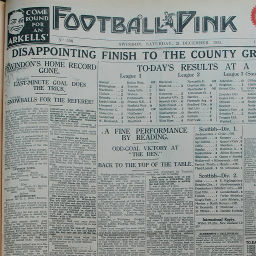 Click to view a newspaper report of Swindon's 0-1 defeat at Bournemouth and Boscombe Athletic in the 1935-1936 season. 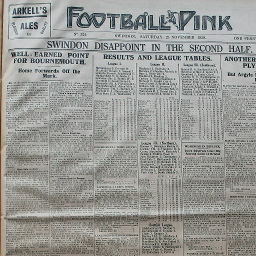 Click to view a newspaper report of Swindon's 2-5 defeat at Bournemouth and Boscombe Athletic in the 1936-1937 season. 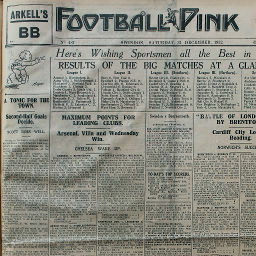 Click to view a newspaper report of Swindon's 3-1 win against Bournemouth and Boscombe Athletic in the 1936-1937 season. 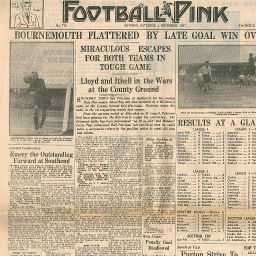 Click to view a newspaper report of Swindon's 2-1 win at Bournemouth and Boscombe Athletic in the 1937-1938 season. 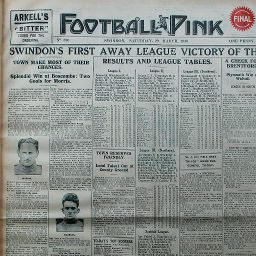 Click to view a newspaper report of Swindon's 4-2 win against Bournemouth and Boscombe Athletic in the 1938-1939 season. 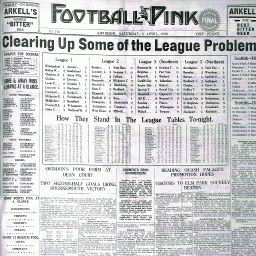 Click to view a newspaper report of Swindon's 0-2 defeat at Bournemouth and Boscombe Athletic in the 1938-1939 season. 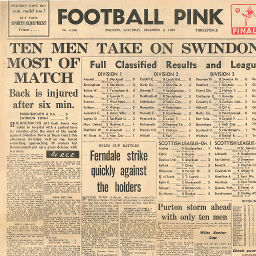 Click to view a newspaper report of Swindon's 0-1 defeat against Bournemouth and Boscombe Athletic in the 1947-1948 season. 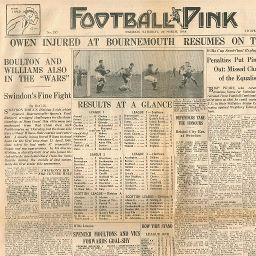 Click to view a newspaper report of Swindon's 0-1 defeat at Bournemouth and Boscombe Athletic in the 1947-1948 season. 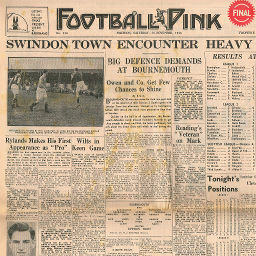 Saturday, November 13, 1948 SWINDON TOWN ENCOUNTER HEAVY "SEAS"
Click to view a newspaper report of Swindon's 0-3 defeat at Bournemouth and Boscombe Athletic in the 1948-1949 season. 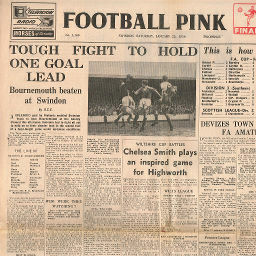 Click to view a newspaper report of Swindon's 2-2 draw against Bournemouth and Boscombe Athletic in the 1948-1949 season. 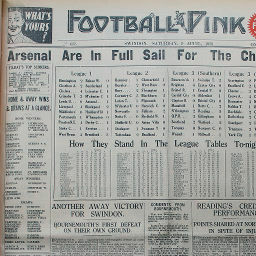 Click to view a newspaper report of Swindon's 3-1 win against Bournemouth and Boscombe Athletic in the 1949-1950 season. 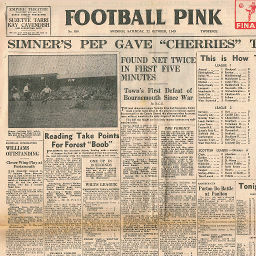 Click to view a newspaper report of Swindon's 1-1 draw at Bournemouth and Boscombe Athletic in the 1949-1950 season. 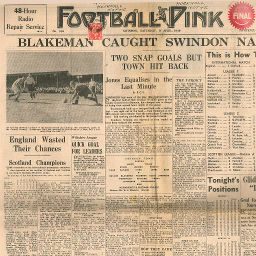 Click to view a newspaper report of Swindon's 2-1 win against Bournemouth and Boscombe Athletic in the 1950-1951 season. 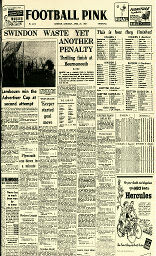 Click to view a newspaper report of Swindon's 1-2 defeat at Bournemouth and Boscombe Athletic in the 1950-1951 season. 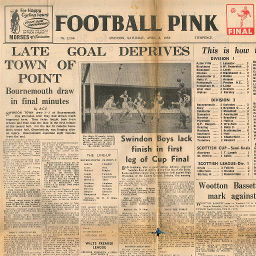 Click to view a newspaper report of Swindon's 1-4 defeat at Bournemouth and Boscombe Athletic in the 1951-1952 season. 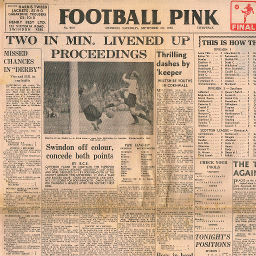 Click to view a newspaper report of Swindon's 2-0 win against Bournemouth and Boscombe Athletic in the 1951-1952 season. 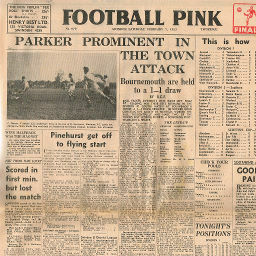 Click to view a newspaper report of Swindon's 1-2 defeat against Bournemouth and Boscombe Athletic in the 1952-1953 season. 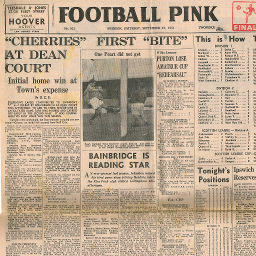 Click to view a newspaper report of Swindon's 1-1 draw at Bournemouth and Boscombe Athletic in the 1952-1953 season. 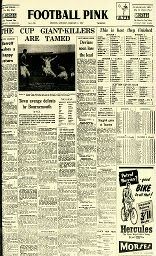 Click to view a newspaper report of Swindon's 0-4 defeat at Bournemouth and Boscombe Athletic in the 1953-1954 season. 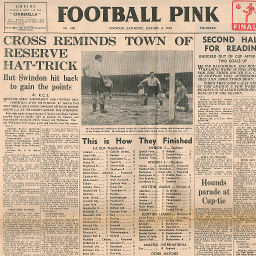 Click to view a newspaper report of Swindon's 2-2 draw against Bournemouth and Boscombe Athletic in the 1955-1956 season. 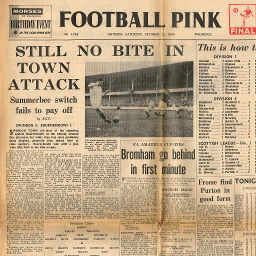 Click to view a newspaper report of Swindon's 0-4 defeat at Bournemouth and Boscombe Athletic in the 1955-1956 season. 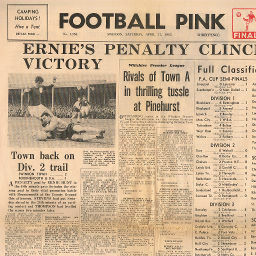 Click to view a newspaper report of Swindon's 2-1 win against Bournemouth and Boscombe Athletic in the 1956-1957 season. 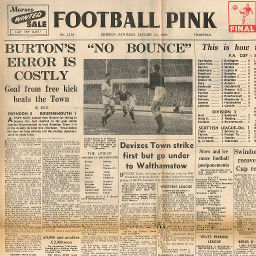 Click to view a newspaper report of Swindon's 1-0 win against Bournemouth and Boscombe Athletic in the 1957-1958 season. 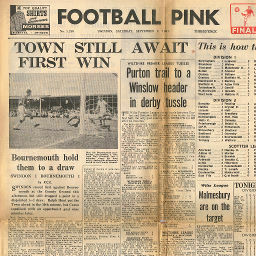 Click to view a newspaper report of Swindon's 1-1 draw at Bournemouth and Boscombe Athletic in the 1957-1958 season. 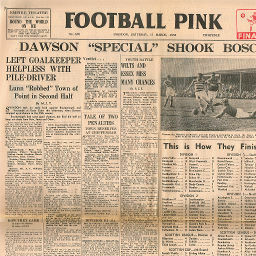 Click to view a newspaper report of Swindon's 0-1 defeat against Bournemouth and Boscombe Athletic in the 1958-1959 season. 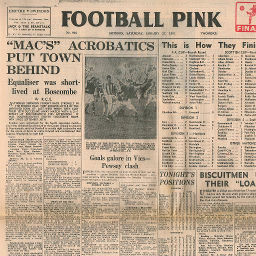 Click to view a newspaper report of Swindon's 3-3 draw at Bournemouth and Boscombe Athletic in the 1958-1959 season. 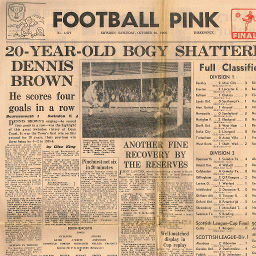 Click to view a newspaper report of Swindon's 0-1 defeat against Bournemouth and Boscombe Athletic in the 1960-1961 season. 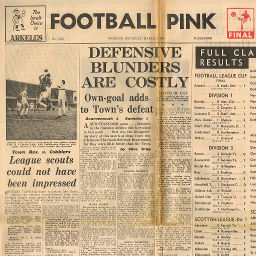 Click to view a newspaper report of Swindon's 1-2 defeat at Bournemouth and Boscombe Athletic in the 1960-1961 season. 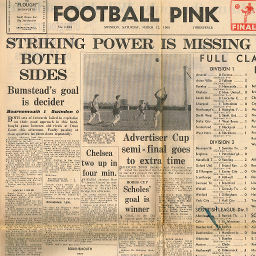 Click to view a newspaper report of Swindon's 1-1 draw against Bournemouth and Boscombe Athletic in the 1961-1962 season. 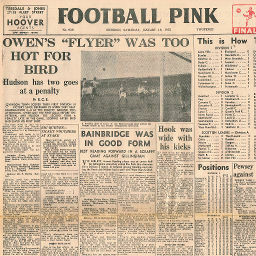 Click to view a newspaper report of Swindon's 0-0 draw at Bournemouth and Boscombe Athletic in the 1961-1962 season. 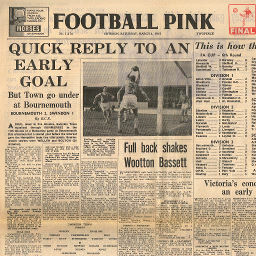 Click to view a newspaper report of Swindon's 0-0 draw at Bournemouth and Boscombe Athletic in the 1962-1963 season. 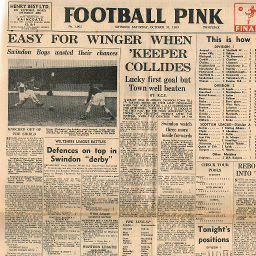 Click to view a newspaper report of Swindon's 2-1 win against Bournemouth and Boscombe Athletic in the 1962-1963 season. 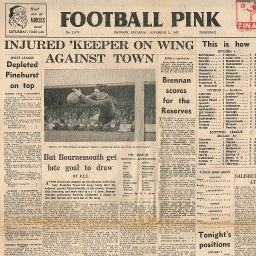 Click to view a newspaper report of Swindon's 0-1 defeat at Bournemouth and Boscombe Athletic in the 1965-1966 season. 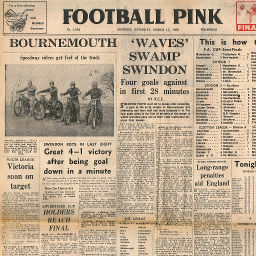 Click to view a newspaper report of Swindon's 4-1 win at Bournemouth and Boscombe Athletic in the 1966-1967 season. 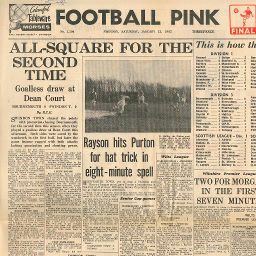 Click to view a newspaper report of Swindon's 4-0 win against Bournemouth and Boscombe Athletic in the 1967-1968 season. 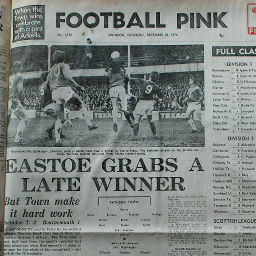 Click to view a newspaper report of Swindon's 1-2 defeat at Bournemouth and Boscombe Athletic in the 1967-1968 season. 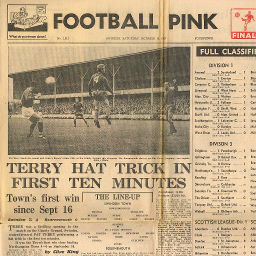 Click to view a newspaper report of Swindon's 2-1 win against AFC Bournemouth in the 1974-1975 season. Score at 90 minutes: 0-0. win 3-1 on aggregate.